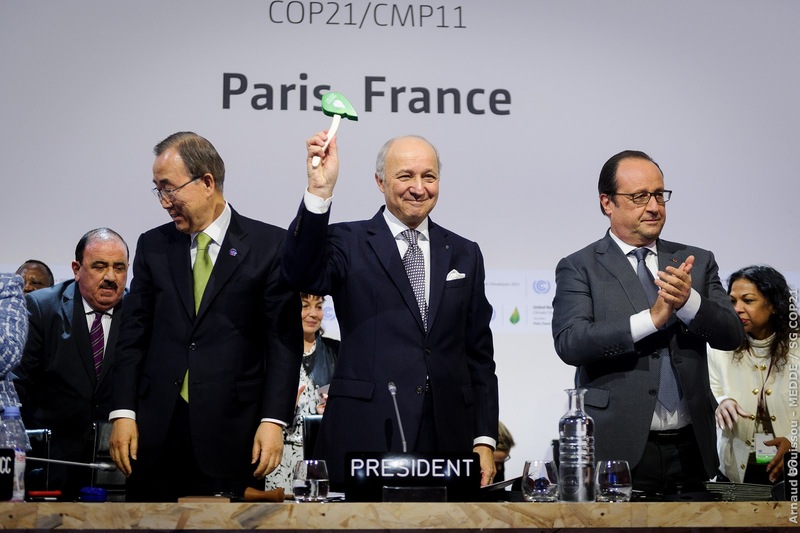 COP president Laurent Fabius flanked by UN Secretary-General Ban Ki-moon on the left and the French president Francois Hollande on the right declares the Paris Agreement adopted. Photo credit: COP Paris via Flickr. The world has got the first ever deal on climate change, covering the entire 195 UN countries. The Paris climate summit (COP21) ended on Saturday evening with a deal having been struck. As having been the case with previous COP’s, this one also ran into overtime. This was despite all the best efforts by the French host to stick to the timetable. But early Saturday evening, the French foreign minister, Laurent Fabius, acting as the COP President, could announce that the Paris Agreement had been adopted. Fabius was met with a standing ovation as he declared the agreement adopted. This will mean that for the first time ever we have a global and partially legally binding climate treaty, covering the whole of the UN. Partially because many elements are still voluntary. But despite the deal not being perfect, it has already been hailed as historic and groundbreaking and has won the support from both business, green groups and national governments. It is predicted it would send out a clear signal that the world is fully committed to deal with climate change and a move towards a zero carbon society. Doing previous COP’s, whether a deal would be legally binding had been seen as make or break issues and has been the stumbling block. A significant element of the deal is the inclusion of the crucial 1.5-degree target. Many developing countries, who is at the frontline of fighting climate change, have been pushing for this target without much success. It appears that the rich developed world has now caved into this demand. But there is a big if and that is that the 1.5-degree target is not legally binding, and nor is the 2-degree target. The agreement sets out that we should do everything in our power to stay below 2 degrees and should strive to stay around 1.5 degrees. A core part of this year’s negotiation process have been the so-called Intended National Determined Contributions (INDC), in which each country put forward their emission reduction targets. This is another controversial bit as each countries INDC will put us on a trajectory for a warming of between 3-4 degrees C – so well above the 2-degree target, something that the Paris Agreement acknowledges. So if the Paris Agreement would have any hope in staying in line with the well below 2-degree target or event a 1.5-degree target, a drastic increase in INDC ambition would need to have been put forward by the next review date in 2020. It was also agreed that the agreement should be reviewed each five years with an aim to strengthen it. 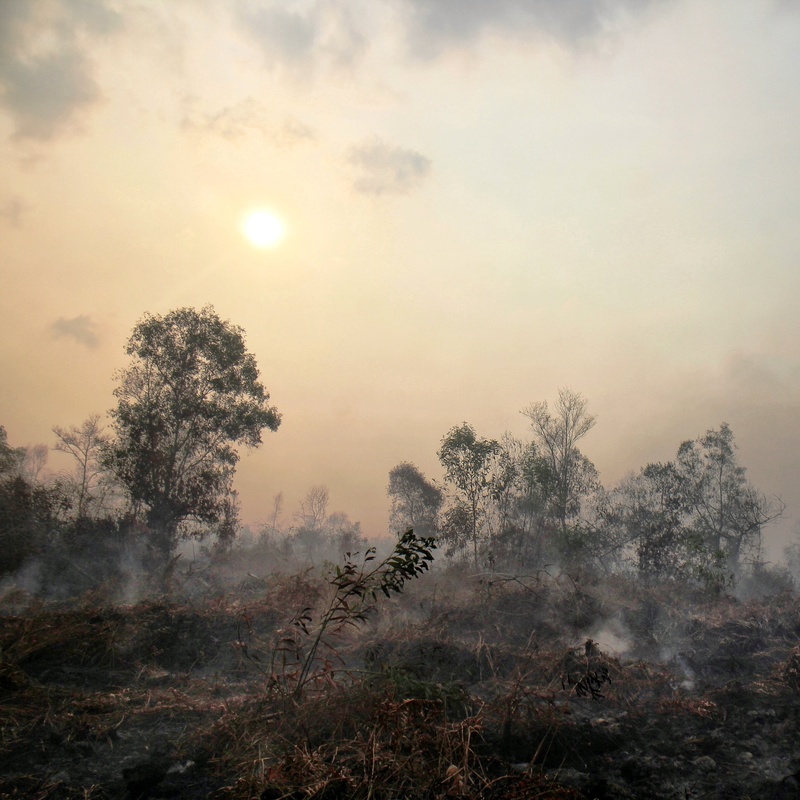 But it still appears that the UN is serious about the inclusion of the 1.5-degree target as they have instructed the Intergovernmental Panel on Climate Change (IPCC) to produce a special report by 2018 looking at the climate change impacts at a 1.5-degree scenario. It was also decided that rich countries should commit a $100bn a year from 2020 to poor countries to help them to develop their economies into low carbon ones, however, this is not legally binding. The international community has paid tributes to the French hosts, in the manner of which they have managed to secure a deal during difficult conditions, and so shortly after having suffered a devastating terrorist attack. The summit had started in high spirits two weeks ago when world leaders attended the first day of the summit. But later the differences between countries became apparent, such as Saudi Arabia wanting compensation for lost fossil fuel revenue. But in the end, following many late night discussions, and sleep deprived nights, the appetite for an ambitious deal was too high and the Paris Agreement was born. The Paris Agreement will be formally signed early next year, and will come into effect by 2020.